Dutch fashion designer Anne de Grijff started her label in 2008. 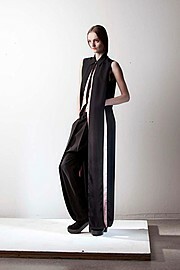 The first collections paired quirky pieces with wearable basics in her preferred hues of black, grey and crème. The sobriety of her colour palette accompanies her minimalistic cut and overall design. There is a predilection for straight lines ..